Jerry is part of the legacy of outstanding athletes at Tucson High School. He earned letters on the basketball and baseball teams in 1950 and 1951 and as a pitcher helped the Badgers win the state baseball championship in 1951 and 1952. He made the All-State team that year. Jerry was the recipient of the 1951 Frank Kempf Memorial Award (now called the Citizen Cup Award) as outstanding athlete of the year. He was a member of the National Honor Society for six semesters and junior class president in 1949-50.
erry coached Little League baseball and youth football for five years each and also officiated Little League in Tucson and Fort Knox, Ky., during his time in the service. As a golfer, Jerry won the Randolph Men’s club championship in 1963 and played on five Citizen Cup championship teams. He is a former winner of the Southern Arizona Best-Ball Championship and served as treasurer of the Randolph Men’s Club for five years. He also was active in bowling and served in a variety of capacities with the Tucson Bowling Association. He is a member of the Tucson Bowling Association Hall of Fame. 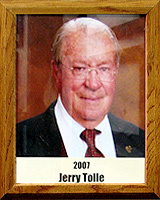 Jerry also is active with the Catalina Rotary Club and Tucson Rodeo.